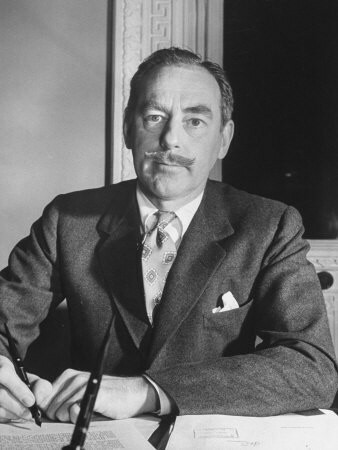 Dean Acheson (1893-1971) was the United States Secretary of State under Harry S. Truman, between 1949 and 1953. Acheson was born in Middletown, Connecticut, the son of a Protestant bishop. Acheson was educated at the Groton School before studying at Yale and graduating in 1915. He later obtained a law degree from Harvard, worked as an assistant to a Supreme Court judge and joined a prestigious private law firm. Acheson worked as a lawyer until 1933, when Franklin Roosevelt recruited him as undersecretary of the treasury. By 1941 Acheson was assistant Secretary of State, where he oversaw American loans and aid to Great Britain. This began Acheson’s long affiliation with the State Department and his role in influencing American foreign policy. A consummate professional, Acheson was well informed on many issues, confident, articulate and immaculately dressed, his large moustache held in place by liberal coatings of wax. Some thought him more like an English aristocrat or cabinet minister than a New England politician. Acheson looked and sounded like a man you could trust – and several presidents came to trust his counsel on foreign matters. In 1945 Acheson became an important advisor to the incoming president, Harry S. Truman. His advice was instrumental in the development of the Truman Doctrine and the Marshall Plan. As Truman’s Secretary of State (1949-1953) Acheson hardened the United States’ position with regard to communist China, led the formulation of the North Atlantic Treaty Organisation (NATO) and pushed for American intervention in both Korea and French Indochina (Vietnam). Acheson was strongly anti-communist, however, he was criticised by the McCarthyists for not taking more assertive action against communism, particularly in China. Acheson retired with Truman in 1953 and went back to private law practice, however future presidents – including John F. Kennedy, Lyndon Johnson and Richard Nixon – often called on him to provide assessments or advice. He was involved in the Cuban missile crisis, serving as a member of Kennedy’s executive committee and advocating a full-scale invasion of Cuba. Acheson later titled his Pulitzer Prize-winning autobiography Present at the Creation, a reference to his role in shaping the post-war world. He died at his Maryland home in 1971, aged 78. J. Llewellyn & S. Thompson, “Dean Acheson”, Alpha History, accessed [today’s date], https://alphahistory.com/coldwar/dean-acheson/.